Our guest today owns four businesses that serve the retail industry. Jason knows every side of the boutique world, so get your pen ready! 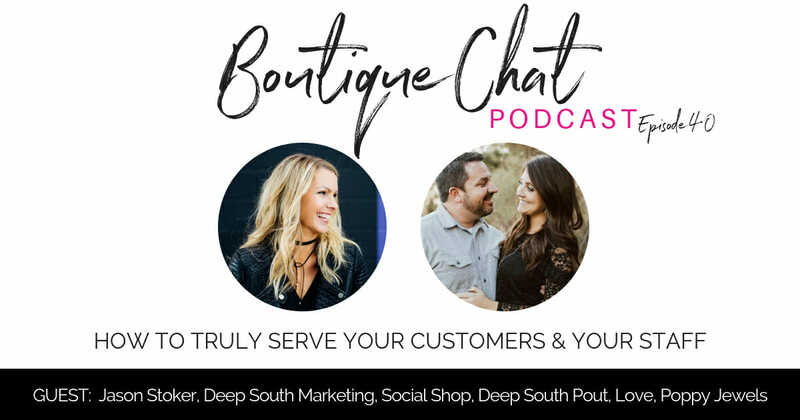 Jason’s wife Shannon started her boutique Deep South Pout in 2011. Short after, the Stokers’ and their business partners started a wholesale jewelry line, a wholesale graphic tee company, and a social selling platform. Jason and his wife, Shannon, started Deep South Pout in 2011 with business partners Justin and Nicole Oswalt. DSP quickly expanded and now has two locations. The boutique has been recognized as the best place to find trendy fashions in the Best of Mississippi for 6 years. The Stokers and Oswalt’s started Love, Poppy Jewels, a wholesale jewelry company, with designer Chelsea McIntosh in 2014. In 2015, the Stokers and Oswalt’s also launched Deep South and Company, a design and tee shirt print shop. In 2017, they started selling their software, Social Shop, a social media comment sales platform. Jason leads the sales and marketing teams for their companies. He played college golf and has degrees in Biblical Studies and Theater. He was a pastor for over 12 years and currently travels and speaks at churches and camps. Jason’s greatest joy is doing life with his wife, Shannon, and their two children Charley and Merri Scott. Did you know you can order wholesale through Social Shop? Using comment selling also pushes your post in algorithms. Cheaper prices doesn’t omit customer service value. 08:40 – All about Social Shop. 14:55 – Successful businesses using Social Shop. 21:30 – Jason’s biggest failure. 29:00 – Customer service is KEY. 36:25 – The future of wholesale. Join the Hub for more trainings, information, and connections.